A 2-1 win against Sassuolo on Sunday saw Juventus maintain their 100 percent winning start to the Serie A. The team now possesses 12 points out of 12, which gives them a 3-point lead over Napoli at the top of the pile. The day was special for the fans of Juve, as both goals for the side came through Cristiano Ronaldo. The former Real Madrid star scored his first goal in the Serie A, and almost ended up getting a hat-trick to his name. 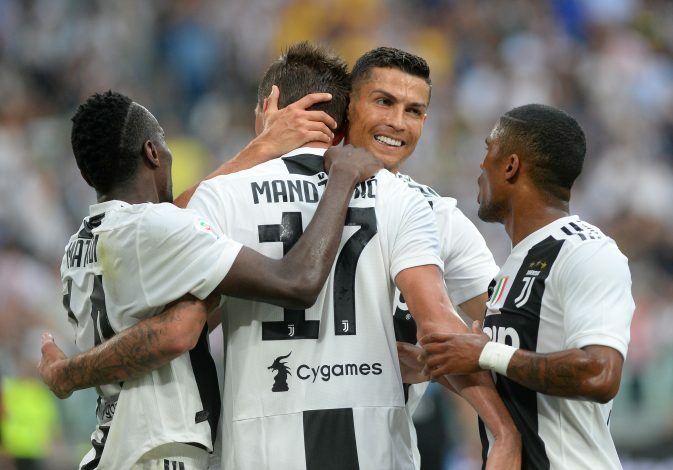 The Portuguese showed glimpses of how he still is the best player on the planet at the moment, and why Juventus are in for a super exciting season in Europe. However, it is very rare that an event related to Ronaldo does not become the highlight of the day, but such were Douglas Costa’s actions and their consequences. The ex-Bayern winger had a night to forget, as not only was he involved in a lot of dirty tackling throughout the game, but also ended it in disgrace with a red card to his name. The Brazilian elbowed Federico Di Francesco in the face in the dying moments, only to follow this with an act of utter stupidity. The pacey winger spat in the mouth of the 24-year-old, and after the action being confirmed through VAR, was given his marching orders. An act that is likely to see him receive a heavy ban and severe punishment, as such actions are not welcome in the sport at all.